The Principal of the Greek Community of Melbourne’s Language and Culture Schools, Mr Manos Tzimpragos, visited the Hellenic American Educational Foundation (HAEF) a few months ago. During this visit, Mr. Manos Tzimpragos was offered a tour in HAEF’s premises by the Coordinator of the Psychico College Schools and Director of Psychico College (High School), Mr. Apostolos Athanasopoulos, and discussed the role of the Greek Community of Melbourne and our schools. The Hellenic American Educational Foundation was founded at the beginning of the 20th century. It is located in Psychico (Athens) and it is one of the most reliable educational institutions in Greece. Today, it offers high quality services in primary and secondary education to more than 4.500 students. Mr. Tzimpragos’s visit took place as a result of the communication and collaboration that was initiated during the design and implementation phase of the “Melbourne- Athens: A Journey of Friendship” Program. The Program commenced in mid-November due to the initiative of the sociologist and Psychico College teacher, Mrs. Maria Filio Tridimas. 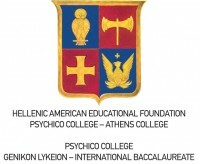 Its aim was to primarily serve the needs of the Greek Community of Melbourne’s Language and Culture Schools students and promote mentoring and interdisciplinary skills to the HAEF’s students (Psychico College) (For more information on the program you can visit the Greek Community’s webpage). During his visit, Mr. Tzimpragos had the opportunity to meet with HAEF’S President Professor Spiro N. Pollalis and discuss the Schools’ special and Summer Programs. At the same time, Mr. Tzimpragos had the opportunity to meet with HAEF’s Deputy Director of Psychico College’s High School (Lykeion) Mrs. Anastasia Papakostopoulou and converse with the Coordinator of the Scholarship Trust Fund, Mr. Dimitris Kapamanos. Mr. Kapamanos, during his discussion with the Principal of the Greek Community of Melbourne’s Language and Culture Schools, noted that the Scholarship Program has been the cornerstone of the pedagogical, social philosophy and a hallmark of the School since its commencement. He also stated that the school’s Scholarship Program is unique to Greece in both its breadth and character. Later that day, Mr. Tzimpragos had the pleasure of meeting with Mrs. Efi Tzavali, HAEF’s Program Director for Education and Information Technology and E- learning. The Principal was informed by Mrs. Tzavali about the Informatics Center. The Informatics Center was established at HAEF in 2010 with the support of George Economou to enhance the use of technology in education. Mr. Tzimpragos had also the opportunity to meet with Ms. Tsiligiannis, who is a teacher at Psychico College, responsible for the coordination of the “Melbourne- Athens: A Journey of Friendship” Club. He also met with Mr. Dionysios Tselentis, Co- Director of Athens College and Director of Athens College (High School). Dr Nick Dallas, a member of the Educational Committee that oversees the GCM’s educational programs, expressed his satisfaction with both the visit as well as the collaboration prospects that the “Melbourne- Athens: A Journey of Friendship” program has created. Mr. Theodoros Markos, Vice President and Coordinator for the Educational Affairs of the Community, expressed the wish that the relationship between the two schools should be further strengthened to include new initiatives in the future”. It is worth mentioning that last weekend HAEF organised its famous annual Student Festival. The festival, also known as Panigyri, is organized to show the projects and the activities that have been prepared as a result of teachers and students’ collaboration throughout the year. It attracts many parents as well as members from HAEF’s wider community. Via the “Melbourne- Athens: A Journey of Friendship” program and particularly through the experiences of the program’s students, the projects and the achievements of the Greek Community of Melbourne’s Language and Culture Schools were presented. At the same time, the Greek Community of Melbourne’s Language and Culture Schools sent by post informative material about their activities and Programs, reinforcing in that way the capacity building between the two Schools.